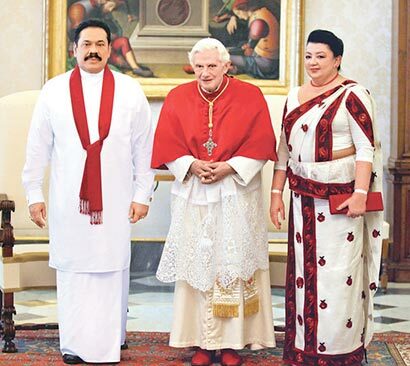 President Mahinda Rajapaksa yesterday met His Holiness Pope Benedict XVI at the Vatican in Rome. Earlier, during his visit to Britain in connection with the Diamond Jubilee celebrations of Queen Elizabeth II, President Rajapaksa had a series of useful meetings with a wide range of British political leaders. ‘Sri Lanka could be pleased with the way things are turning out with regard to the conduct of its international relations,’ External Affairs Minister Prof G L Peiris told the Daily News in a telephone interview from Italy yesterday. while in Britain, the President met Queen Elizabeth II on three separate occasions. The President also met British Prime Minister David Cameron, Opposition Leader David Miliband and Secretary of State for Foreign and Commonwealth relations William Hague. Later, at the residence of the Sri Lankan High Commissioner to Britain, Dr. Chris Nonis, the President met leading personalities of the House of Lords and the House of Commons, numbering around 25 such personalities. He also met the Sri Lankan community based in Britain and had fruitful discussions. While in Britain, President Rajapaksa also met Commonwealth Secretary General Kamalesh Sharma and discussed arrangements for the next Commonwealth Heads of Government Summit in 2013 and also dealt with a range of other Commonwealth matters. Meanwhile, Prof Peiris will meet the Italian Foreign Minister in Rome. Prof Peiris said while in Britain, he had a useful meeting with the British Foreign Secretary.